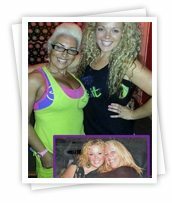 I qualified as a Zumba Instructor in September 2011 and prior to that I was exercise shy. I had stepped in maybe 2 gyms in my life up to that point. I found previously exercise boring and repetitive and felt that it truly wasn’t for me. I have always liked keeping fit and at 15 years old I competed in School gymnastics competitions. I also taught step aerobics in the 80’s and competed on horseback! Then came the kids and the flab! (an excess of 17 stone) so I decided to do something about it! I weighed 26 Stone before I started Zumba. I started with 1 class a week and ended up losing a massive 6 stone in 2 years. I then decided to become an instructor because I was by then well and truly bitten by the fitness bug!! I also took my Level 2 Exercise to Music qualification. I was looking to do a gym course as a friend of mine, Sue Foy Williams promised me a job in her gym, Fit In (where everyone fits in nicely). I contacted HFE and spoke to Yvette who was great and took care of my enrollment. I was subsequently signed up on to the course! Throughout my course Gary was there to cajole, coax and threaten me when needed to ensure that my work was completed! Throughout my course Gary was there to cajole, coax and threaten me when needed to ensure that my work was completed! (ALL in a nice way I hasten to add!). I did have an old injury to my knee where I had previously had to undergo and arthroscopy (keyhole surgery) for 2 meniscus repairs and a twisted cruciate ligament. While I am still not fully recovered from this surgery, but HFE were very helpful and understanding throughout my training. I enjoyed meeting up with the other students in the gym and practicing our lesson plans; this I found to be very helpful. I now plan to start teaching in the fitness industry asap. I currently run my own Zumba business but I also intend to progress and perhaps complete a nutrition course and some other form of dance-based fitness programme.